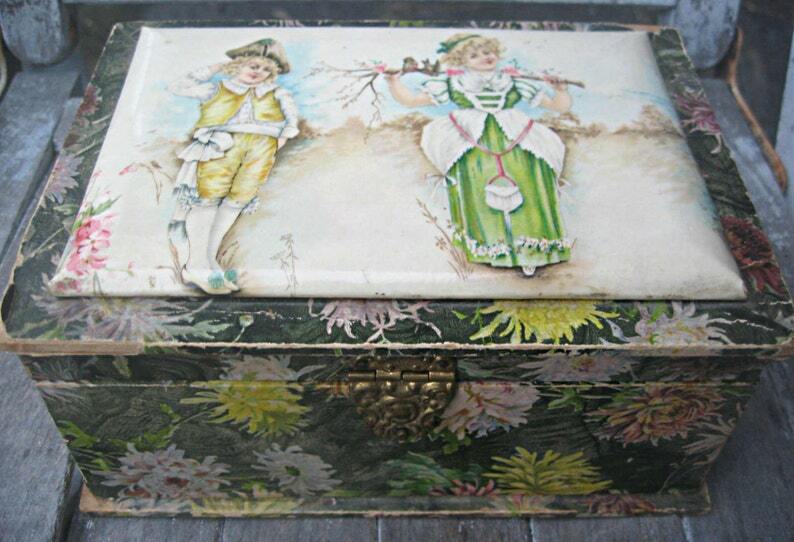 This is a stunning antique box in very good condition. I love the vibrant colors of dark green with what look to me like mums and gorgeous leaves. The celluloid top depicts a young couple and is so beautiful! The young woman is holding a branch behind her head with 2 small birds perched on it. The inside of this box is lined with a light gray/blue silk and underneath the lid the fabric was missing so I added some beautiful green and cream endpaper from an antique book that I had. What a special box to keep your personal treasures in or to use as a gift presentation box. Measures 7 1/4" wide, 5 1/2" deep, and 3 1/4" high. The clasp is in good shape and the inside does smell a bit musty from age which will dissipate if left open.